This model is a case study in being handed a sketch and developing the artwork from there. I modeled the crate and winch and photographed the textures I needed for everything you see with the exception of the combo meal itself. A close-up of the construction. I like to build my models as accurately as possible in order to avoid construction questions that can quickly be resolved with a picture. ronically, Wendy's design agency started providing sketched of their flat designs as 3D retail concepts after I sent them a pencil sketch doing the same for their 2D art. Apparently that idea took hold. But I digress. Another example of making models based on co-worker sketches. in this case, Dan DeGraw sketched up some prototype leaselines for use in Wendy's. Naturally, I started with modeling their fixture. I took measurements and modeled the leaseline to scale. By working in this way, I can test how elements go together virtually before they get to the physical prototyping stage. 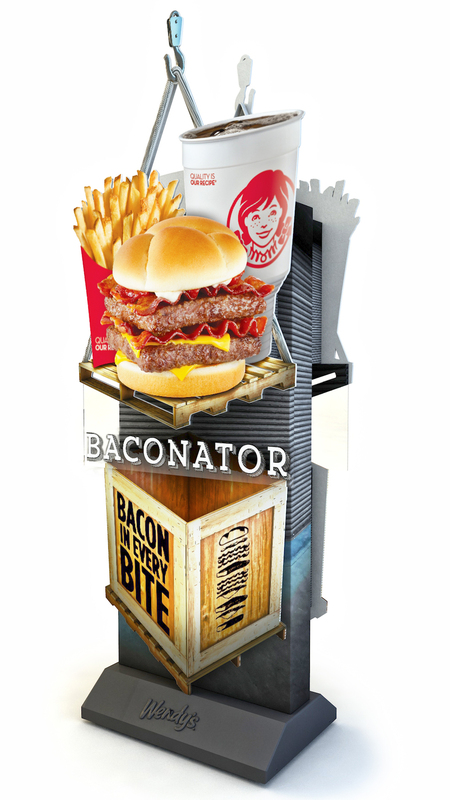 3D models created for Wendy's.